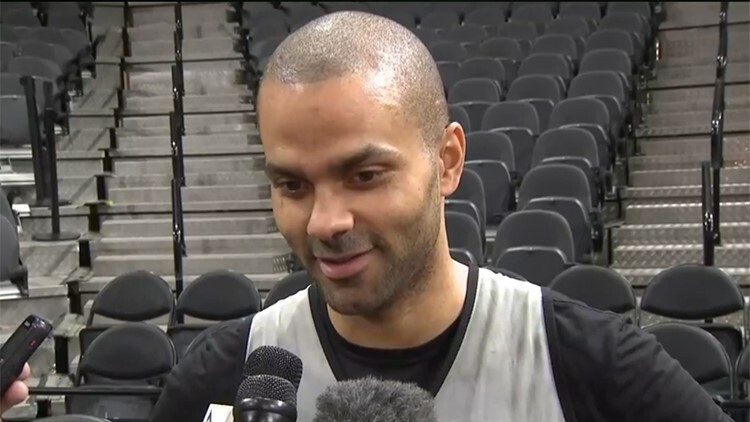 Tony Parker talks to media before his first game back in San Antonio with the Hornets. The Spurs legend will play against the Silver and Black for the first time as a member of the Charlotte Hornets on Monday night. SAN ANTONIO — Walking into the AT&T Center for Charlotte’s shootaround Monday was a poignant experience for former Spurs point guard Tony Parker, who signed with the Hornets last summer after playing 17 seasons with the Silver and Black. Parker will play against the Spurs for the first time when they host Charlotte on Monday night. Only 19 when he started his NBA career with San Antonio in 2001, Parker became the team’s starting point guard five games into his rookie season and held the job until being replaced by Murray last January. Teaming with Tim Duncan and Manu Ginobili, Parker won four NBA championships and was MVP of the 2007 Finals during his 17 seasons with the Spurs. Parker, 36, signed a two-year, $10 million contract with the Hornets last July. Ginobili's retirement a month later marked the end of an era for the Spurs. Teammates for 14 seasons, Duncan, Parker and Ginobili won four titles together and more games than any other trio in NBA history. Parker said he never thought he never thought he would play for another NBA team. “I thought I would finish in San Antonio,” he said. So what is Parker expecting Monday night? “Just going to have fun and reflect on all the great years we had here,” he said. “Talking with Timmy (Duncan) yesterday – he came to my house – he started talking like an old guy. Time goes fast, man. That’s all I can say. Time goes really fast. Popovich and Parker developed a father-son relationship that transcended the basketball court. "He's definitely like a second dad," Parker said. "I have a very, very special relationship with Coach Pop. It goes beyond basketball. Especially when you're a point guard, you're already going to have a special relationship with your coach. But when you come in at 19 years old and what we went through together as you grow and try to establish yourself in this league and try to win -- because it's very hard to win in this league consistently -- it was just very special. "I will always be grateful for everything he helped me (with in) in this league. It's definitely going to be nice to see him before the game. A lock for the Naismith Memorial Basketball Hall of Fame, Parker averaged 31.1 minutes, 15.8 points, 5.7 assists and 2.8 rebounds in his 17 seasons with the Spurs. A six-time All-Star, Parker made the All-NBA team four times. Hornets coach James Borrego said he considered moving Parker into the starting lineup for Monday night’s game, but decided against it. "I don't want to put Tony in an uncomfortable position," Borrego said. "He understands where he's at with this team and his role here. He's going to get plenty of love tonight, no matter when it is." With Charlotte playing in the Eastern Conference, Parker’s appearance at the AT&T Center on Monday will be his only opportunity to play in San Antonio during the regular season. The Silver and Black complete their two-game series with the Hornets on March 26 in Charlotte. "I'm really excited for him, just to feel the love again from the fans, the crowd," said Borrego, who was a Spurs assistant coach for three seasons before getting hired by Charlotte last May. "It's amazing. "When you leave a place, a lot of times, you're just appreciated more when you come back. You go away, they love you more when you come back. I'm excited for the fans, too, to have that opportunity to love on him tonight." "It's just a different challenge," Parker said, reflecting on his decision to sign with the Hornets. "That's what I was looking for."